I will be reprising an introductory version of my newest workshop If Not Now, When? at the Camden Public Library on Tuesday, January 15th and Thursday, January 17th, from 12 Noon to 2 pm. This progressive, 2-day class is designed to get you to manifest that story you keep saying you want to put on the page. The New Year is just around the corner – time to get your intentions in play! Call the library to reserve your seat today. Limited to 12 participants. Are you ready to make the most of the your creativity as we turn the page on 2019? Please join me for a Writing Workshop that will begin in early January and run for 6-to-8 weeks. We will meet weekly for two hours. Is it time to breathe life into some characters who have been rambling around in your brain? Or perhaps capture the chapters of your life? Make the most of our introspective season and begin, or expand, your story in a supportive environment. This class will be a hybrid, as I will include both fiction and non-fiction writers in the group. You will be supported in your writing goals and encouraged to produce new work each week for sharing. You can expect to receive custom advice for your work, as well as original prompts and exercises to get your creative juices flowing. All levels of writers, both new and experienced, writing across all genres, are welcome, provided they are motivated and open to a group experience. Feedback will follow an acknowledgement model as opposed to critique. You will need to adhere to good artistic camaraderie. Classes will be held in a private setting in Camden, Maine. Please email questions or register at TheVillageScribe@hotmail.com. I look forward to helping you bring your story to the page! Poet Richard Blanco will be my special guest in the WRFR Rockland/Camden, Maine radio station tomorrow, Tuesday, May 29th from 6 pm to 7 pm. If you are not in the local listening area, you can stream the live show globally from WRFR.org. Please tune your FM dial to 93.3 Rockland/99.3 Camden. He will be reading from his latest work, Boundaries, a collaborative effort with landscape photographer Jacob Hessler. The work has been on exhibit at the Center for Maine Contemporary Art. Read more about the book in The Portland Press Herald. Selected by President Obama as the fifth US presidential inaugural poet, he joined the ranks of such luminary poets as Robert Frost and Maya Angelou. The youngest, first Latino, immigrant, and gay person to serve in such a role, he read his inaugural poem, “One Today,” at the official ceremony. Blanco has said he was made in Cuba, assembled in Spain, and imported to the United States – as his mother, seven months pregnant, and the rest of the family arrived as exiles from Cuba to Madrid where he was born. Only forty-five days later the family immigrated once more and settled in Miami, where he was raised and educated. The negotiation of cultural identity and universal themes of place and belonging characterize his body of work. Blanco is the author of several poetry collections and the memoirs The Prince of Cocuyos: A Miami Childhood and For All of Us, One Today: An Inaugural Poet’s Journey. He has been a Woodrow Wilson Visiting Fellow and received honorary doctorates from Macalester College, Colby College, and the University of Rhode Island. Among his many awards and honors was the Academy of American Poets naming him as its first Education Ambassador in 2015. He has continued to write occasional poems for organizations and events such as the re-opening of the US embassy in Havana. He lives with his partner in Bethel, Maine. Visit him at www.richard-blanco.com. 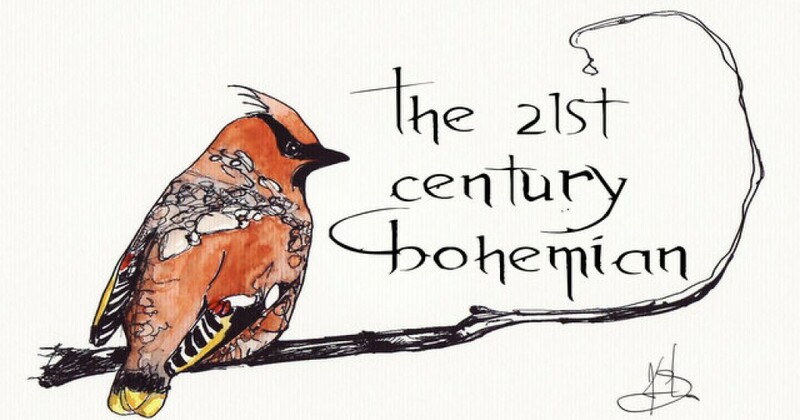 Every Tuesday from 6 to 8 pm, 21st Century Bohemian transmits an insightful, inspirational and celebratory exploration of creativity over the local airwaves, through the voices and creative process of various artists, musicians and writers. For more information on the 21st Century Bohemian program and the many other community radio offerings from WRFR in Rockland, please visit wrfr.org. The station celebrates its 16th anniversary this year and offers community radio programming from an all-volunteer roster of DJs and hosts. Our diverse and varied schedule offers something for everyone! The snow from recent Nor’ Easters has yielded to the sun and warming temps here in Maine and we begin April with a mostly clear landscape. Can it be the weather gods will smile on us and keep the dreaded mud season at bay? We can only hope- and pray! Excited about my 21st Century Bohemian radio show schedule this month which kicks off tomorrow, from 6 pm to 8 pm, with me solo in the studio, spinning some vintage Southern Rock from back in the (hey) day. Read all about it and more in this Village Soup article! Your website is state of the art, your brochures are glossy or environmentally conscious, you are adept at every social medium platform. Your staff is in command of the latest technology and you have a slick design team. What’s missing? Having all the bells and whistles won’t be effective without good content. As our culture becomes more digital intense, your message can get lost. Customers want to know what your company is about. That is why a strong brand identity is crucial. They want to know your story. The human psyche is not wired to remember facts and numbers – we are wired for story. Good content delivers your brand effectively. It conveys what makes you unique and separates you from the crowd. Story drives business. Reset your content and increase business. I offer copywriting and editing at reasonable hourly and project rates. Is it time to set your own story on the page as memoir or personal essay? Everyone has a story to tell. Telling your personal story can help you look at the trajectory of your life and make meaning of it. In Memoir & Personal Essay the focus is to generate engaging narrative. Crafting solid fictional stories requires strong writing resources. My Creative Writing workshop delivers the primary elements of character development, writing natural dialogue, conveying your writing style, experimenting with setting and place, how to plot development in a story and choosing a point of view to tell the story. You will also learn how to hone your senses to add depth and lushness to your writing. Cultivating an understanding of the Hero’s Journey as envisioned by mythic scholar Joseph Campbell, instructs writers and other artists in the foundation of story and why it is crucial in developing stories that appeal to readers and other audiences. I provide individual coaching for writers and other artists. The objective is to bring you into alignment with your unique creative process, create a vision that embraces your artistic nature, set motivating but attainable goals, and develop a foundation of creative ownership around your skills and talents. In this class we distill life experiences and themes for the page through original writing prompts and traditional writing exercises that have been proven to deliver meaningful narrative. Putting your life story on paper can take many forms. Modern memoir is deeply layered and textured, richly depicting a character arc over time. We will focus on generating narrative that connects you with your own essence and experience of humanity. Through exploration on paper, the writer can bear witness to their evolution and transformation, and make meaning of their journey. Personal essays offer the writer an economy of space and words to create short pieces that can powerfully depict your unique experiences and perspectives, and provide a map of sorts for others. This is a dynamic class that will take you into a deep, but refreshing, dive into your life. You won’t come up or leave empty-handed! This workshop is meant for anyone new to the craft, looking to develop tools they will need for the writing journey, as well as experienced writers who want to refresh their approach and gain a new perspective as they begin a new project. You will spend 5 hours immersed in creative writing fundamentals, crafting pieces driven by original writing prompts and leave with several pages of new writing. Together, we will explore sensory writing, to add depth and lushness to your work. Create characters who are appealing and capable of evoking empathy. Write dialogue that is natural and moves your story forward in a purposeful manner. Play with different settings, or time and place, to discover what will best serve your work. Explore different styles, or elements and techniques, used in storytelling. This 1-day, 3-hour class, will feature the elements of the Hero’s Journey as envisioned and extrapolated by mythic scholar Joseph Campbell. Gaining an understanding of the fundamentals of the Hero’s Journey will help inspire any creative – writers, artists, musicians, photographers and more – interested in the underlying structure of story. You will be immersed into the heroic quest through stories, myths and fairy tales, as well as modern feature movies. The stages of journey will be highlighted and you will be introduced to the archetypes, or characters, that heros encounter as they make their way through a story. This is a seminar-style format designed for group discussion. New Group Launches this Month! An ongoing study group for women that meets twice monthly on Mondays, over 4 months, to read and discuss the landmark Women Who Run with the Wolves book. We will explore the Wild Woman archetype, as described and explored in stories and myths that celebrate the divine feminine, feminine spirit, soul and intuition. As we read and study, we will share our our own stories, observations and reactions in an effort to embrace our instinctual nature – to celebrate our creativity and honor our passionate spirit and wisdom. This longtime NYT bestseller was written over the course of 20 years by a respected mythic scholar, Jungian analyst, poet and traditional Latina cantadora. Three (3) sessions for $100. Offered between January and March 2018. I have worked with writers and other artists for over 20 years. We will work one-on-one to bring you into alignment with your unique creative process, create a vision that embraces your artistic nature, set motivating but attainable goals, and develop a foundation of creative ownership around your skills and talents. My coaching practice is driven by two decades of working with creatives (in groups and individually), informed by practical and proven tools and excercises, nurtured by diverse healing traditions, inspired by classic quest and story paradigms, rooted in supportive coaching and motivation philosophies, and steeped in techniques honed through Artist Conference Network. Teresa Piccari is the proprietor of The Village Scribe, which offers professional copywriting and editing services. She is a professional writer with experience in media, advertising and corporate settings. She has been teaching writing for 21 years. She also provides coaching/mentoring for writers and artists. Teresa is a longtime columnist who enjoys writing about creative process. She hosts and produces The 21st Century Bohemian, (a companion piece to her column of the same name) a weekly radio program on creativity at WRFR 93.3 Rockland/99.3 Camden and streaming globally at WRFR.org. Register Now! Just 1 week away from this creative, fun and transformative weekend! This 2-day workshop for women will support you in reclaiming, nurturing, and celebrating your feminine essence to help you thrive in this crucial time in our culture that is demanding a balancing of both the masculine and feminine. Come spend two days on the beautiful coast of Midcoast Maine in creativity and fun! Led by Teresa Piccari (writer, holistic teacher, creativity coach), Carrie Connors Hedstrom (fiber artist, poet, dancer) and Amanda Roberson Austin (architect and crafter). We will gather for 5 hours each day – from 10 am to 3 pm. You will be supported in identifying your unique feminine essence as we share our stories, experience guided visualization, create art, make ritual, write, reflect, converse, and dance. Come on out and get your goddess on and connect with your authentic essence! There is still space for you!